1) Keep your cats inside. If your fabulous felines are allowed to roam during any season, they can exposed to infectious diseases, including rabies, or they might get lost or be stolen or killed. During winter months, though, another hazard is that cats can freeze outdoors. That’s why stray or feral kitties sometimes sleep under the hoods of cars, risking injury from the fan belt when the motor is started. That’s why, even if your own pets are safe inside, you should bang loudly on your car hood before starting your engine just in case a cat needs time to escape. 2) Never let your dog off the leash on snow or ice. Dogs can quickly become lost during a snowstorm. Be sure your dog always wears ID tags. 3) Thoroughly wipe off your dog’s legs and stomach when he comes in out of the sleet, snow or ice. Your precious pooch could ingest salt, antifreeze or other potentially dangerous chemicals if he licks his paws. Also, his paw pads may bleed from snow or encrusted ice. 4) Never shave your dog down to the skin in winter. A longer coat will keep him warm. In addition, when you him during colder months, dry him completely before taking him out for a walk. If your pet is a short-haired breed, consider getting him a coat or sweater that hs a high collar or turtleneck with coverage from the base of the tail to the belly. Boots are a good idea as well. 5) Never leave your dog or cat alone in a car during cold weather. A car can holding in the cold and cause the animal to freeze to death. 6) Puppies do not tolerate the cold as well as adult dogs and may be difficult to housebreak during the winter. You may be better off paper-training him inside. 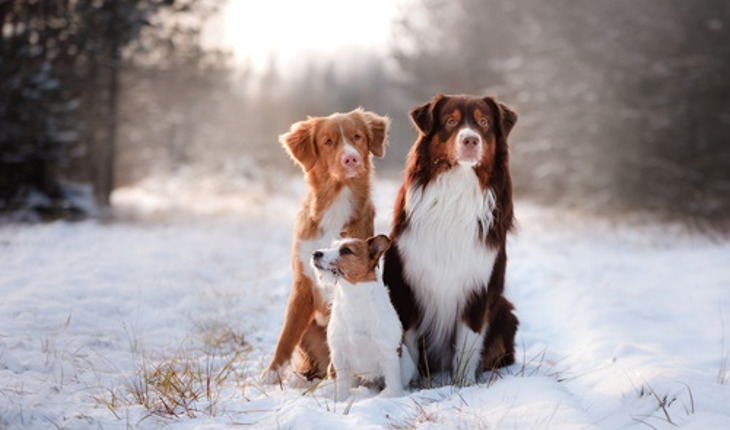 Also, if your dog is sensitive to the cold due to age, illness or breed type, take him outdoors only to relieve himself. 7) Increase the food supply for your dog if he spends a lot of time engaged in outdoor activities. Up his intake, particularly of protein, to keep him and his fur in good shape. 8) Like coolant, antifreeze is a lethal poison for dogs and cats. Never fail to thoroughly clean up any spills from your vehicle and consider using products that contain propylene glycol rather than ethylene glycol. Visit the ASPCA Animal Poison Control Center for more information. 9) Make sure your pet has a warm place to sleep, off the floor and away from all drafts.A cozy dog or cat bed with a warm blanket or pillow is ideal.